Xamarin Live Player lets you make live edits to your app and have those changes reflected live on the device. 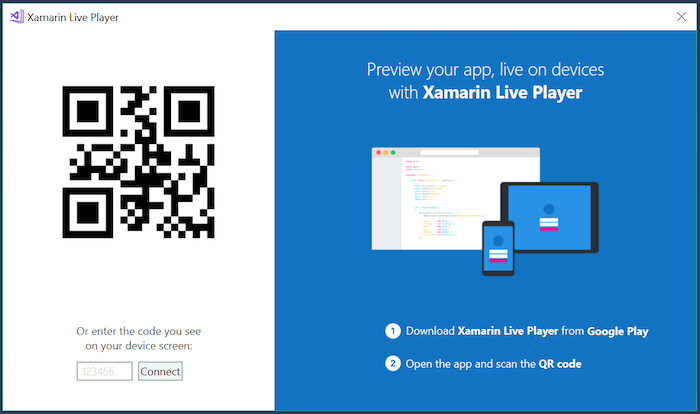 Your code runs inside the Xamarin Live Player app – no need to set up emulators or to use cables to deploy! This article describes how to set up Xamarin Live Player. Live Player Preview is only available in Visual Studio 2017. Xamarin Live Player is available for Android by intalling directly from HockeyApp. Visual Studio 2017 15.4 or newer. A Visual Studio computer and a device on the same WiFi network. Go to Tools > Options... and select the Xamarin > Other tab. Create or open a Xamarin project (or a sample). If you have already paired a device, it will be available as an option. Otherwise you'll be prompted to pair a device when required. Start Without Debugging – you can edit the app and see the changes occur on the device (app is restarted as changes are made and the file saved). Start Debugging – you can set breakpoints and inspect variables, but code cannot be edited. Alternatively, select Tools > Xamarin Live Player > Live Run Current View, which lets you edit the app and see the changes occur on the device. The current view is shown (instead of the application's main screen). 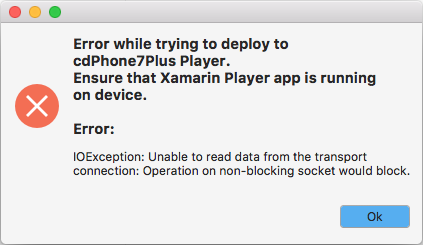 If a device is already paired and the Xamarin Live Player app is running on the device, the code will execute straight away! If the device cannot be contacted for pairing, an error may appear. Open Visual Studio for Mac. Go to Visual Studio > Preferences... and select the Projects > Xamarin Live Player (Preview) tab. Choose Live Player in the device list. 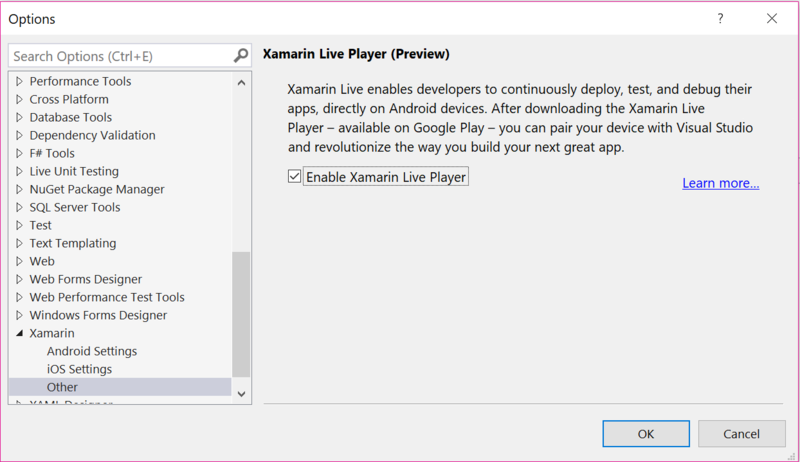 Choose Xamarin Live Player Devices... to manage the devices you wish to use with Xamarin Live Player. Live Run Current View – You can edit the app and see the changes occur on the device. The current view is shown (instead of the application's main screen). If you experience any issues or can not connect, see limitations and troubleshooting.